PAM: Hi everyone, I’m Pam Laricchia from livingjoyfully.ca and today I am here with Hema Bharadwaj. Hi, Hema! PAM: Just a bit of background for everyone. 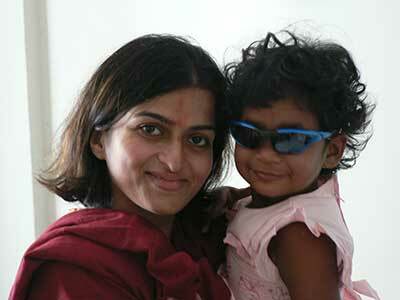 I have known Hema for many years now. First online in unschooling groups and then we met in person over the years at various conferences and gatherings. In 2016, I came across and connected deeply with Hema’s art. As I was working on a book about the unschooling journey, told through the lens of Joseph Campbell’s hero’s journey, which I have been working on for three years, I had come across many illustrations of the hero’s journey online. Soon after seeing Hema’s work, I could not shake the idea of illustrating the unschooling journey for my book, so I reached out to her and we soon began a super fun side-quest to do just that in her beautifully whimsical and intricate style. 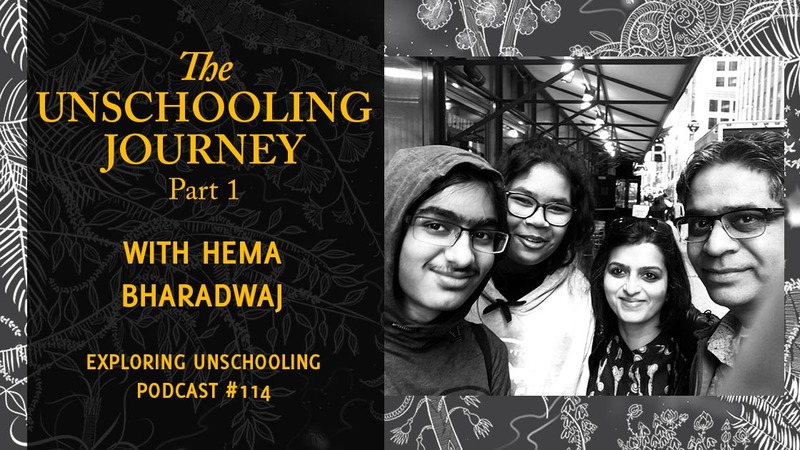 I thought it would be great fun to chat with Hema about her illustrations and how they relate to her unschooling journey with her family. So, to get us started, can you first share with us a bit about you and your family? 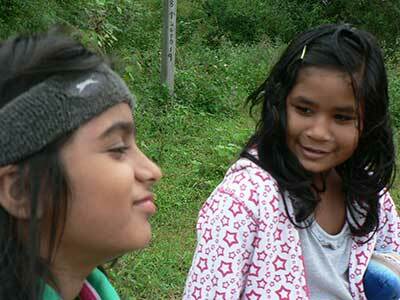 So maybe I will give the ages; Raghu is almost 15, and Zoya is almost 12, in just a few weeks. A long time ago, Raghu would stop us and say, “How come you are not asked your ages?” So, I will say, Ravi is 50 this year, and I am 43. Ever since then, I have always done that; if somebody asked my kids ages and I was right there, I will be like, “And I am 43.” It is always something with Raghu, that he will point out these things that adults do, so it stayed with me. Ravi was raised in India, actually, if I could just give a little background; it helps to give a flavour for who we are. Ravi was raised in India and I was raised in United Arab Emirates, which is a tiny little country in the Saudi Arabian Peninsula. So, we both were raised in different countries. 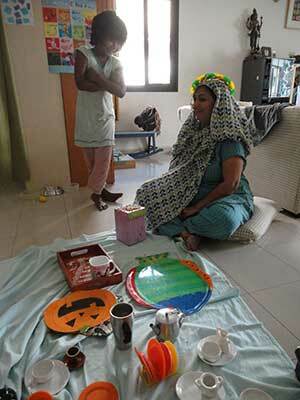 I was exposed to Arabic and English and Kannada and Hindi at home; Ravi was exposed to Telugu. We were both basically multilingual, but our common language eventually became Hindi. So, in our home, we have Hindi and English mostly. Ravi moved to the US when he was 22 and loved the US and pretty much always wanted to live here. I was studying in Bombay as an undergrad, I did my arts there, I did my advertising years with some work, and then I joined the masters program at NYC, met Ravi and just did not look back. Settled down in New Jersey. Since we had Raghu and Zoya, somewhere when the kids were four and one, we moved to Singapore, and then moved to Pune, which is another city in India very close to Bombay actually—which is now called Mumbai, by the way, to be correct. Then four and a half years ago we moved back to the US. So, we have had a checkered sort of past, building communities as we travel and our unschooling journey was all along, pretty much. PAM: Wow…Yeah, that is really cool to hear. So, I have known you through various moves, because mostly we connect online, right? HEMA: Yes, that is right. PAM: Very cool. Okay, so, now let’s dive into the unschooling bit of your journey. We are going to start with the first illustration you did, which is titled, “Ordinary World,” and that appears in stage one of our journey, which is, “The Call to Unschooling.” I was wondering if you could talk a bit about how that image came about for you. HEMA: Yes, so I want to say at the outset that when I read your book, I found it so rich and I was like, “Oh my goodness, she has visually made this book so rich, what am I going to bring to this? I cannot possibly add to it, it is so visually rich.” And short of illustrating the actual stories and my theological inspiration and the hero’s path itself, I was wondering what would come to me. I really wondered for a little while. And I would sketch and doodle and then, all of a sudden, it became clearer to me that I am a hero right here. So is Ravi, so are my kids; we are heroes of our path. What does that journey feel like to us? And so, it became my own, and then I was like, “Wait a second, this is becoming clearer.” So, I kind of followed my feelings towards these illustrations and they came from that space. I was not sure whether it would match your vision and I was so thrilled when you felt the same. HEMA: I loved the experience of drawing this first image because when it became clear to me years ago that Raghu came and changed our lives, just overnight. I remember one night he was an infant and he was 5 days old, maybe, we were so scared to sleep right next to him, even though my mother who, bless her, she was with me through all those days and she assured me, “You will not roll over on your child, you will be fine.” You know, she was the attachment parenting extraordinaire who did not know the term, attachment parenting, but just knew from being her beautiful self that all is well. I always had a feeling that school had not worked out for me quite the way I wanted it to, so I did carry some school baggage although I apparently did well at school according to whatever my parents thought was well. But I did not feel well, I felt like my learning was never complete. The bell was always ringing just as I got a concept in my head, and I had struggled with that. So, then Raghu came along. I was fortunate; I was working from home, I did some teaching, I was already out of the stressful advertising world and into art. Oh my gosh, centering into my art and centering into Raghu and getting to know Ravi as this incredible man who would give me so much space and say, “I will wake up and change his diapers any number of times, you just get your rest.” He was working full time, doing his masters at that point part time, so I feel teary when I think about this because I feel like my journey started on that footing. Then the more we thought about preschool as he got to two and a half, I had never heard of unschooling, I did not even hear about homeschooling, so I felt that the choices were school. I had never actually questioned that, I wonder how I never did, but anyway. HEMA: You know, school was a given and I remember sitting on the counter as a 12-year-old and a 14-year-old and always arguing with my parents, always giving them these gigantic spiels on how school was wrong and how it should be “this” and “why can’t they listen?” and “what is the point of this historic lesson vs learning what is going on in the world now?” and all kinds of stuff and my mother would just listen and listen, and at the end of three hours of my tirade, she would say, “Alright, and now you have school tomorrow, Hema, you got to go get dressed,” and I would go right back. I remember that dissonance that I had with the idea that somebody outside of me was going to tell me what to learn. And that had stayed with me over the years and I am just grateful. I feel like big forces work in my life, outside of me even, that have just guided me, I don’t know, it’s from my gut. 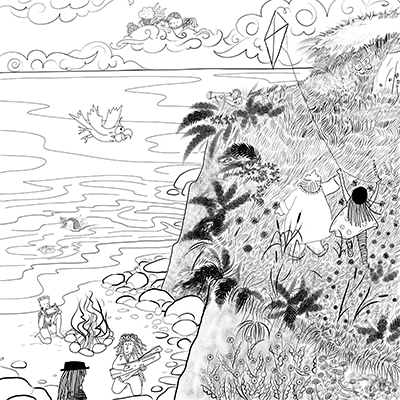 So, my little cloud people in this illustration, “Ordinary World,” are my gut. I know it sounds horrible, what a horrible comparison. I think that journey started around the time that Raghu was two and a half, went for a little preschool, he only went three days a week, only for three hours at a time. I was sitting right outside that door because he would refuse to be inside if he could not see me through the window. Now this little preschool was the most delightful, beautiful little Montessori. The parents who ran it, one of them was a Rabi and the other woman was my yoga teacher and they were just beautiful. They were these women who were attachment parenting, you know, what could go wrong, right? This was this amazing preschool that I found, and Raghu rejected it. And then it started to come up; one day he told me in the kitchen, maybe a month into the preschool experience, or two, and he said, “Can I go to school only on Fridays?” Now this is like, just shy of three or around three, and I said, “Oh, why Fridays?” He said, “Oh, because that is the day we get to make challah,” which is the bread they make on Fridays. It would be this beautiful little ceremony; they would be given grape juice. So I began to see that little school and in this image you can see this little child looking at the bird through the window and in the other window, you see a poster that depicts pretty much the same exact scene of the cliffs and what you see in this image is on a poster inside with children looking at the poster vs turned around and looking at the real world. And I’m thinking, “We can do all of this and more at home,” and I felt very complete and said, “I can handle this age,” but I was not sure about handling the rest of the years. I was just getting into it, thinking, this does not make any sense and through his allergies, which is another gigantic story, that if people are interested could look up, it is on my blog and I made a little video chat about it because I was so passionate about that topic, about how the allergies and my understanding that his little body knew what it needed from all the food groups of the world that I presented to him and I did not have to worry. So, all of these little factors came together, and more and more school looked like this thing that was not the real thing. I don’t want to call it fake, because I am a product of school and I appreciate schools and what they bring to many families. I was just grateful that at that point Ravi and I could choose homeschool. We could choose to say that I do not need to work anymore. I mean I could continue teaching a little here and there, but I was home and that was huge. And all of a sudden everything made sense. I am like, ‘yes, I feel so good being with this little being who was so wise,’ and would look at me and just question everything, which was my original spirit. That was me growing up and I just zinged. PAM: Wow, yeah that is awesome. This first picture, “Ordinary World,” always really hit me because I loved the way that you put the image inside, because that is what schools try to do, right? Trying to help kids learn about the real world while they are inside the school, but with that little girl looking outside the window and seeing it in real life; that always gives me goosebumps. PAM: So, is that what you were trying to get across? I mean there are so many little details in this to really dive into. That was the feeling in me when I first stumbled upon Sandra Dodd’s website, because once you look up the word “homeschooling,” it just is like anything else, you know. You start thinking about a topic and the next thing you know, you bump into 50 reflections of it all over the place and I loved it. I could not stop reading. He would fall asleep and I would read. He would wake up and I would go to the library and find more books about it, and I immersed myself because it sang to me, is all I can say. For me it was a heart connect. HEMA: But I loved it. I love saying often that both of my children have been raised in the same house with the same parents, same things, same everything, same opportunities and they are so different, so unique. I am amazed that there was a time when I was all about books because Raghu was all about books. I love books anyways, so I was always collecting books and I collected books just for the illustrations. 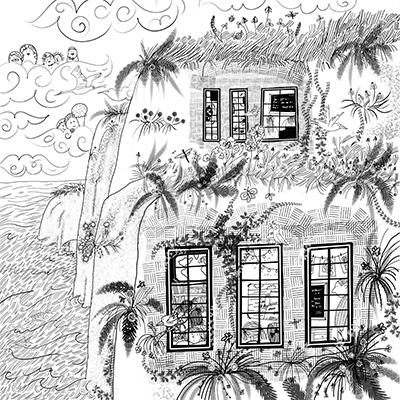 There is a beautiful book by John Muth, I think, and it is called Zen Shorts, and Raghu loved that book for whatever reason, even though I thought the stories were a bit moralistic, but it was beautiful, I liked it. I did see there was a great spirit to it. He loved it, so I discovered that he loves illustrations, he loves the stories, and I am looking at all of these books and then Zoya comes along and is like, “Books? What can I do with it? Can I make a house with this? Can we tear the pages out? Can we cut it up?” You know, completely different viewpoint of books. At that time, I think I was more immersed in Sandra Dodd’s website because that is the one that gave me so many examples of families living in this way that all of a sudden, the world was my playpen?? PAM: The world was my oyster? PAM: Yeah, I love the way you worked that in. You know with Raghu, when he was very little and Zoya was not quite with us yet, and it was that phase, I think she was maybe a young baby, I think I was still caught up in Raghu’s way of thinking, which was quite logical, he was very construction oriented and fact-oriented, so it was a world that I understood because I was like that as a child. The child in the tree, relaxing, as I immersed, he no longer had to be something I needed him to be, he could just be. And be himself and I could be his partner, his facilitator, his companion. PAM: It’s lovely, because that is that next stage, right? 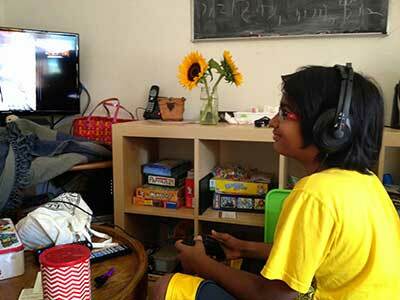 You discovered homeschooling, and unschooling and now there are just so many possibilities. And it’s just bubbling up. And yeah, I love the “find adventure.” For those who have not heard the story yet—I am sure I’ve told it on the podcast before—but that was always kind of Lissy’s mindset, and when she turned 18, for her 18th birthday, she got “find adventure,” a small tattoo, just to remind her. PAM: And we were in Vegas when we did it! Because that is where she wanted to go for her 18th birthday. And for me it was a huge shift to learning so much more about the people, like you were talking about the differences between Raghu and Zoya, right? And it is learning about them individually, it is learning about unschooling, and trying to figure out how we are going to mesh those exciting ideas into our actual day to day lives. What inspired you with this illustration, which is called, Transitions? HEMA: Yes, I think in my mind, when this illustration came about, I had to go back to that phase and I think in the book it is close to a part called, “Embracing Beginners Mind,” and I thought that was so perfect because I found myself doing this fun thing where I would get up in the morning and felt like it was a restarting all over again like rebooting like a computer. It is a little scary some of the times, it was for me, to wake up and realize that, ‘Wait, we have nowhere to go? Don’t little kids go some place when they are about four? Aren’t they supposed to be somewhere and oh my gosh, am I screwing this up? Should I be doing something?’ And then, all of a sudden, I get all frantic. I needed the trust, so I definitely looked for the stories; I am eternally grateful to the hundreds of women whom I found online sharing their day-to-day moments; moments of frustration, moments of what worked, what changed, how they felt. These women, and men of course, but I seem to connect with a lot of the women, wrote lots of bits of their unschooling journey and I was piecing together a new visual because I needed a visual to walk towards, because until then the only visual had been school, alternate school, really alternate school, maybe Sudbury, but that was it. Maybe Waldorf; I had a fascination with some of the beautiful aspects of Waldorf and every time I would bump into it, I would be like, “Ugh, it is not working for me,” and I walk away because Raghu was learning everything that Waldorf does—and I am generalizing here because I know there are many interpretations—everything Waldorf said they should not be using and doing, blah blah blah, everything of that kind was exactly what Raghu wanted to do and see and blah blah. I was like, ‘Ok, you know what, there is something not working. Go back to the center.’ So, it’s like a restart and this night of transitions that I feel emanated and this image of just taking that moment. It ties in so beautifully to saying embracing the beginner’s mind, restarting. When I felt shaken because I was like, ‘Oh my god, my child is not reading, most kids are reading,’ because I would bump into somebody whose child was the same age and was reading. I would bump into somebody and they would have a different experience and I would be like, ‘Oh my god, my child…’ I would even start comparing because comparison is so easy. It is so a part of how I was raised, the whole school system is based on comparison and how much do you know, how much does the other person know. Anyways, so I would bump into people and I would get a bit shaken up and I would start comparing notes even with other unschoolers, thinking, ‘Oh my god, that unschooler knows how to do this, I should probably know that.’ I had to go to the core of it, go down to what the point is of living like this. Why does it matter, when what matters to Raghu is all that matters? Don’t get me wrong, there were nights where I was worried. I even worried what Ravi was feeling, because he did not have as much time. We had moved to Singapore at this point and I felt like I was responsible for my children’s education, whether they were turning out ok, is everything going to be ok? I did not quite find an unschooling group. I did find some friends; built a little homeschooling community around me, found people. Mostly, I had to keep coming back to my children and just stop there and say, ‘Ok, Zoya loves water, mud, sand, and watching people. and watching other children. Not engaging as much.’ And I am like, ‘Alright, if we spend four hours at the playground, that is ok.’ But the idea that we had just spent four hours at the playground, is that learning? These were the things that I had to solidify a bit more inside me. See, in spirit I got it. My spirit got unschooling. It never even connected with homeschooling because unschooling is where my spirit was. I got it, I had wanted that all my life but all of the parts of me that had gone through school, that had been raised by parents who were doing their best and saying, “Hey, you know, we need you to learn this and this and this, only if you learn this will you be successful in life.” All of that was getting shaken up. And nights of transitions. It makes so much sense and this stage, Joseph Campbell calls it “The Belly of the Whale,” because, I mean, we literally cocooned in our basement for the first six months because like you said, you have to find a way to ignore and to move past those voices that make you want to compare, that knock you off your game, and to focus on your children’s voices. That whole beginner’s mind, that is why I called it that because that was where I had to be. I had to keep reminding myself that the things I thought I knew, I was not comfortable with anymore, yet I really had to find a place for all of these wonderful new ideas that I had come across, but yes, it takes that time. I just love that metaphor, in the belly of the whale, because you need that space to yourselves. Then you talked about how you were figuring out or seeing the learning and where is the learning in there, because that leads so nicely into the next stage. Now, as you are embracing this beginners mind, you are learning about your children, you’re starting to open up to all of these new ideas in your new world. Now we are moving into our new unschooling world and the next stage I called “Challenging Our Beliefs about Learning,” I took the road of trials of Joseph Campbell’s hero’s journey, and I broke them into two areas; learning, and parenting. Because those are two huge aspects of our journey, right, and I want to dive into each one individually, so with this one, we called it, “Learning,” which is awesome, and now we are playing out on that cliff, right? HEMA: Yes, the very cliff, it is the same world. I loved that I went back to the cliff. I wondered why I was staying so close to the water all the time. As you will see in a couple of images, there is a reason for it, but, at this stage, I had to be in the same environment. It is not like I was taking my children and going away somewhere. I was still in the same environment and I wanted that to translate into this image by being on the same cliff, just playing and being right there, but outside doing whatever it is that we wanted in the same world. The learning and the parenting being separate, yes. There is a small story here. It is a story about reading, which is such a big deal to most of us. It slowly has become less of a big deal for me and I have learned so much, why it’s not that important, but I have to stay true to who I was way back when this early understanding of learning was happening for me, and I am grateful for that moment. While it is nice to have that early success, it is like, ‘Oh my kid started to read, I did not have to do it,’ I would like to immediately contrast that with Zoya, who is reading only just now, in spurts, like she is getting into it now, and she is soon to be 12. She has taken her own time and I want to say, I learned that my delight could be equal in her kind of learning. It is so different. To Raghu, words mattered. I remember in a library once, he was running and I had to stop him and very often with Raghu, I had discovered a big word would stop him. At that point I think I had just learned it, and I said, “Hey Raghu, there is a book here,” and I just quietly kind of pulled him away because I could make out something that was going to stop him from running in the library and he said, “What?” and I said, “Hippopotamus, there is a book on Hippopotamus,” and he is like, “What is that?” You know and oh my gosh, and ever since, his connection to vocabulary and words and what they mean and the nuances… So that was an early start that today is what makes him who he is. Reading in bed was misery for her because Raghu loved to be read to every night without fail, even during the day sometimes, like, as soon as she fell asleep he would be just like waiting, “Read read read,” and to Zoya that was the most annoying thing ever. We always had a big box of toys on the floor and her learning was with her hands. Pulling things apart and making things work. Splashing in water and putting unusual things from the house in the tub to see what would happen. Figuring out that the taps worked both ways and you could get burnt with hot water. I do not know why she would keep trying, just to see. Is it going to be hot water? Is it still hot? Her learning was completely different and I was blown away. I am like, ‘Is this normal? Is this what happens when we do not force them to learn to read, write, put labels, blah blah blah, you know what I mean?’ It just blew my mind. Learning of all kinds slowly. I cannot say that what I speak today is who I was, I feel like it was in spurts, every day I learned a little more and got a little better. I would take stock sometimes and stopped because it was too much. She was like, “Wait, wait, halt, I am not ready for this next big thing,” whatever it was. Zoya wanted to jump into pools without her floats. How do I support that? It is really hard. PAM: No, those are amazing examples of this whole point, right? That whole stage we are questioning what is it that they really need to learn, so that we can get comfortable with the fact that curriculum and directing it really is not necessary. Seeing how you saw with the reading stories that you shared, just how completely different people’s learning styles can be when they are free to approach things however they want. And yet you still see her learning amazing things in her own way. I think that is what I love about unschooling and what is so hard about unschooling, is that everybody’s journey is so different. You had those two children, so they had you questioning those things. They gave you those examples and you had your own experience with school and then another parent will have had a different experience that is in their own lives growing up and will have different children. So different things will come up for them, but this stage still happens for everybody, it just can look very different, can’t it? PAM: And then, the next illustration that you did, which is called “New Perspective,” which I love, I think that this is definitely one of my favourites. I have a water thing too and this one just kind of hit me in the soul, as well. This stage would be the other part of the road of trials, if we are looking at the hero’s journey stages, and I called this, “Shifting from Control to Connection,” so this is the parenting aspect as well. I would love to hear some of your thoughts behind this one. HEMA: Yes, so while these illustrations were coming to be, we had these little Easter egg moments; you were feeling for the water, we were feeling for various little things. The mermaid, who is not in this image; this image is one of the images where we do not have anybody except this little child. 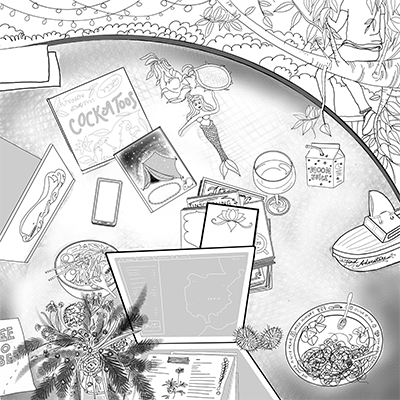 I just want to share that in the previous image, we have the mermaid; playful, the parrot out there, and I felt like the mermaid is my reminder to play. The parrot was my reminder to stay light and fly. And the cloud people were my intuition. There is a grandpa and grandma just always on the peripheral somewhere, because that was a part of our experience. Our experience was that our family was incredibly unaware of what this crazy learning was, but then we were already the crazy people in the family, so they were all like, “Oh well, they are just themselves,” so it was ok, but they are a big part of it. I want to bring that to this new perspective, the road of trials, because I want to say that I had to really look at life from my child’s perspective, and this image is just one child because that one perspective matters so much for me. I saw Zoya connecting with my mother in law, connecting with my parents, and that was her learning, and I had to look at that, I had to find a way to see that. While Raghu was interested in, ‘Who were the Mayans? And, what was history? When did man first appear? What was evolution?’ These were his kind of questions. Meanwhile, Zoya was all about, ‘Can I paint your nails? Can I do this? Why are your nails…?’ And she would notice things about their bodies, she would ask them questions and they responded. To their credit, I have to say, I think they responded beautifully, and it allowed me a different perspective. I think they played along with her because Zoya is such a playful force that anybody in her vicinity is just going to have to play, because she is just like that. I think the grandparents just could see that, ‘Oh my god, look at this one child who asks us these questions about why am I at the alter? Why is this ceremony this way?’ All these questions. Zoya once just sat in my mothers in law’s kitchen and watched her make paratha, which are these little flat things made out of dough that we fry and they puff up and she just sat there and ate them, and watched, and it was Zen-like. It was like what is this, this is beautiful. I had a new perspective, new insights that there is a different vision of the world within my child and I am just being invited for the ride. And I had to go from controlling what that outcome was with the grandparents or with the environment to connecting with my child, for which I needed to see from their point of view. Which I did not always succeed at. I did not always get what they were trying to do, and then I learned a lot more. I think you write much more beautifully about this in this book, there are so many ways to describe all of these nuances and these skills that we can pick up, so that the trust becomes deeper. 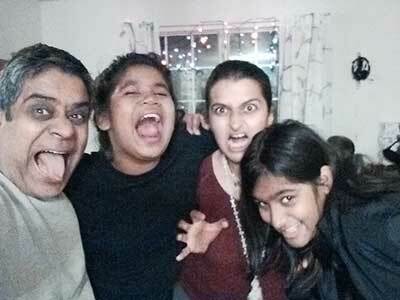 I want to mention that around this time—I think we were in India—we were just settled into Pune, our experiences were expanding but I still had to stay true to my children in a new cultural environment. In an environment that I had not actually lived in except as a student, which is a very different experience of any country. So, living there with a family, I got to see things in a new light. My mother-in-law was so sweet, there would be Raghu just hammering at burnt bits of rock and charcoal and stuff and there would be like a black mess all over her balcony and she did not bat an eyelid. To me, even today when I think of those moments, where she was just like, “Yeah, yeah, of course. He wants to hammer something.” I mean, I do not think they could see…so do not get me wrong, if you ask them, “So was that part of the unschooling?” It is not that. They just connected with the spirit of the child. I saw more and more of that in India, and I am ever grateful for that, in that society. 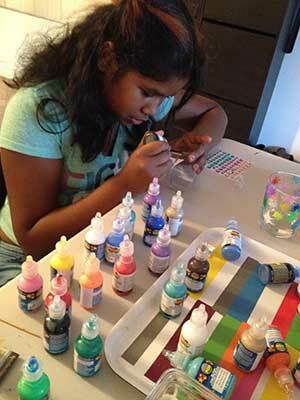 HEMA: I have included a picture in this little bunch of photos that I am hoping can be shared. The picture of my mother, just sitting on the floor with a tiara thing made of flowers, and the gigantic dupatta which is this cloth that we wear over our shoulders over certain Indian outfits, and she has it all over her head. It was a moment in time that is just such a capture of who my mom is for Zoya; sitting and just playing and being who Zoya wants her to be. There is another one where Zoya pretty much made my parents students in a school. Now, she has no idea what school was, so this was a perspective. I began to see—and I think I am backtracking to learning here for a moment to say—that the learning is in all of this. Meanwhile Raghu was involved in GTA, he is just three years older than Zoya. He was in the front room playing GTA and talking about the nuance of the game and how he had to do this in order to get this and, “What is the math in this? How can I get this much money? What do I need to do?” I mean while Zoya is like, “Oh, you are my students and now we are going to have lunch. We have to go fix lunch, Amama, let’s go.” That is what she calls my mom. The road of trials, I feel, is a beautiful way to say that I did not always see everything as some sort of smooth beautiful garden that I was in. It was full of awakenings for me. Every time I chose the connection, which was not always. I keep saying this, just to say that it is a huge growth. You can get unschooling in your spirit and still struggle with the day to day, which might tie into parenting, right? PAM: Exactly, yeah. I mean, this, to me, is where the rubber hits the road. It is when you are trying to bring all of your intellectual understanding of unschooling and figuring out number one, how to be an unschooling parent with your children, but also observing and seeing how unschooling and this lifestyle is unfolding with your children and you are learning from them. Like you said, that is why I loved the road of trials because so many of these things are counter to what we have been told to expect, and our relationships are so different than the relationships with our children that we are told we are supposed to have. That control. That power. That we know best. I talk about whether these are your monsters, what are the particular things that come up for you. In each of those stages, the learning and in the parenting, I talk about five truths in each of those that were ones that I struggled with. Ones that I needed to learn about, needed to work through. The hero’s journey book, by Joseph Campbell, is called The Hero with a Thousand Faces, because there is just so many different ways through it. It is very personal to every single person. 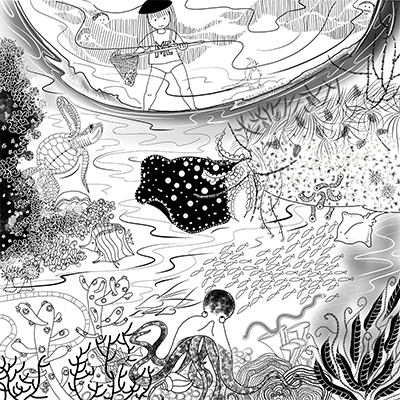 And my favourite thing about this illustration is that this new perspective is jarring, in that you are looking from under water and you are looking up at this girl and it is just such a cool perspective the moment you realize. You are like, “Hey, what’s up here?” for a second, right? I was trying to position myself, like “Hey, where am I?” So that knocks you off for a second and then to realize where you are, and then to see the child in her joy. And I love her t-shirt, it says, “Me.” Watch me, my perspective, what I choose, what I am doing; this is valuable. 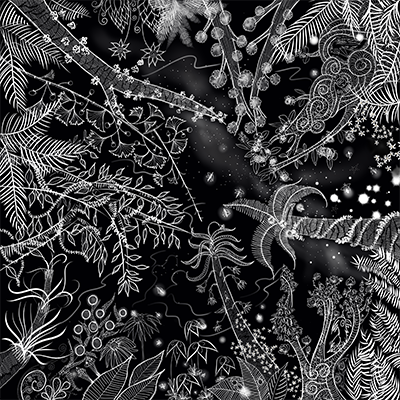 And just all of that in an illustration, it all comes out, that always amazes me. See, my art is words and that is what I love so much about working with you. Your art is visual, and it is just amazing to see all the different connections that come up between the words and the art. HEMA: Well absolutely, I thank you for speaking about it like this, because I could not have worded it how you did just now, it is beautiful. PAM: Yes, it has been fun! Our conversation continues the next week, in episode 115.